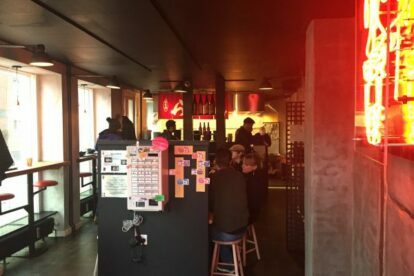 The Ramen craze has finally hit Copenhagen with Ramen shops popping up around the city. One of the high-profile ones is Ramen tu Birru. Being one of the shops in the Mikkeller beer empire it has instantly become a hit with its authentic ramen and great beers. Mikkeller is a world-renowned brewery famous for extreme and innovative beers. They have opened beer bars and restaurants around the world, including japan & San Fransisco. In Copenhagen check out Warpigs, Mikkeller Beer bar, Mikeller & Friends and Mikropolis. The shop is held as traditionally Japanese as possible: You enter, order from a Japanese ticket machine, go to the counter to get your drink and find a seat. Ramen is a traditional Japanese noodle soup. At Ramen tu Birru the ramen master (who has been headhunted from Japan) prepares three classic chicken-based varieties: Shoyo (broth flavored with Soy sauce), Shio (broth flavored with salt) and Miso (broth flavored with Miso, the Japanese bean paste). After making your selection of soup, you can choose between a number of specially made Mikkeller beers made to suit the ramen. My personal favorite is the Ramen to Birru, a hoppy Belgian ale brewed with Brettanomyces yeast that lends a certain funky barnyard aroma that suits the soup perfectly.